Prior to starting the Whole-Grain Challenge, I amassed a collection of cookbooks — from my bookshelves, the library, and the Culinate office — and piled them into a tower next to my desk. 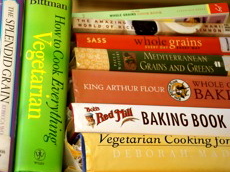 Over the last month, I have gleaned cooking tips from these books, earmarked recipes (more than I actually cooked), and referred to them for various posts, as well as the Whole-Grain Glossary. If you're interested in reading and eating more whole grains, check out the following 12 cookbooks. If you're wanting to expand your knowledge of whole grains and learn basic ways to cook them, this is the book for you. One of the most comprehensive books on whole grains, Whole Grains Every Day, Every Way offers background information as well as cooking tips and recipes. I like the grain profiles, which include graphs on the various forms of individual grains, historical and nutritional facts, and straightforward cooking techniques. Recipes that caught my eye include Chinese Black Rice, Orange, and Avocado Salad, Wheat Berry Salad with Apples and Mint, and Whole-Wheat Almond Biscotti. Grains in this book are divided into chapters based on their native origin: America, Asia, the Near East, Europe, and Africa. Wood gives an overview of each grain (cultivation, various products, selection, storage) as well as cooking basics and recipes. I like Wood's range of recipes, some familiar and basic, others imaginative and worldly: Mom's Wild Rice Stuffing, Chili-Flavored Tortilla Chips, Quinoa Carrot Cake, Barley Dolmadakia, Kamut Pita Bread, and Injera, for starters. The design of this book is so busy I find it hard to look at, but it's full of good information; I especially like the Grains Cooking Chart, which gives ratios of grain to liquid and cooking times for 15 grains. There are lots of appealing recipes: Overnight Smoked Salmon-Spinach Strata with Whole Wheat, Multigrain Biscuits and Rolls, Quick Summer Veggie-Wild Rice Soup, Spicy Yellow Split Pea Quinoa Dal, and Maple Oat Crisps. Marie Simmons is one of those authors who takes a single subject and researches it thoroughly — this is actually her second book on rice. All rices are explored here through a glossary, cooking methods, and recipes. The salad chapter shines with whole-grain recipes: Black Rice and Snow Pea Salad and Grilled Chicken, Brown Rice and Broccoli Salad with Tamari Almonds, and Brown Rice, Mango, and Smoked Chicken Salad with Lime-Tamari Dressing. An oldie but a goodie, my copy is coverless and dog-eared; I've been cooking and referring to this book for more than 20 years. The back pages include sensible nutrition information as well as graphs on the nutrient composition of grains (and other whole foods). Tried and true recipes include Bulgur Wheat Pilaf, Helen's Polenta with Eggplant, and Tabouli. Not your grandmother's guide to grains, Super Natural Cooking takes a fresh, hip look at "natural foods," peppered throughout with Heidi Swanson's lovely photographs. There's an entire chapter on grains, as well as recipes and tips spread throughout the book. From its pages I cooked and loved the Otsu (Soba Noodle Salad) and the Brown Rice Sushi Bowl. Still on my docket to cook: Spring Minestrone with Brown Rice, Farro with Green Onion Sauce, Toasted Walnuts, and Asparagus, Ginger-Amaranth Shortbread, and Red Quinoa-Walnut Cookies. I have yet to cook a Paula Wolfert recipe that I haven't loved; her books are the result of extensive research and cooking. This is not a whole-grain cookbook, but there are some terrific bulgur recipes to be gleaned from its pages: pilafs, kibbeh, salads (the Bulgur Salad with Red Pepper and Walnuts is fabulous). I also enjoyed the one-dish meal of Spicy Fish Fillets with Bulgur and Caramelized Onions, Latakia Style. For experienced cooks and dedicated grain-and-greens eaters, this book is filled with stories, history, and in-depth instructions for cooking traditional Mediterranean foods. At first glance, it's intimidating: recipes that span multiple pages, as well as not-your-average-American fare (breakfast grain soups). That said, for anyone endeavoring to eat more grains and dark leafy greens, this book is an inspiring resource. For many, Mark Bittman's How to Cook Everything books have become standards. His recipes are contemporary and straightforward, combining traditional versions along with more worldly cooking trends. The grain chapter of this book stands out for its tips on substituting brown rice for white rice, the graphs of Everyday Grains and Grains for Enthusiasts, and Bittman's suggestions for stocking raw grains and storing cooked grains. The best thing I gleaned from this book was Bittman's encouragement to cook grains "the easy way": boil and drain. This is my go-to book for cooking seasonal produce and whole foods. I appreciate Madison's friendly voice, meticulous research, and winning recipes; she has a way of synthesizing the essential information about grains. Narrowing favorite recipes is like counting stars, but here's a few to whet your appetite: Quinoa Salad with Mangoes and Curry Dressing, Polenta Gratin with Mushrooms and Tomato, Soba with Hijiki and Stir-Fried Vegetables, Bulgur Pilaf with Pine Nuts and Currants, Pita Bread, Banana Oat Muffins, and Amaranth Cornmeal Bread. I'd be hard-pressed to believe that the name "Bob's Red Mill" is new to you if you have even a minimal interest in eating whole grains. The Bob's Red Mill product line is reputable and far-reaching, both in product and availability. The front pages of the book include a history of the company, a whole-grain primer, explanations of various grinds and equipment, and information on baking ingredients. The rest of the book is all recipes: yeasted and quick breads, flatbreads, crackers, pies, tarts, cobblers, crisps, cakes, and cookies. Many of recipes in the muffin chapter looked enticing: Lemon Poppy Seed, Carrot, Orange Spelt, Applesauce, and Pumpkin Quinoa. It's easy to be suspicious when it comes to cookbooks authored by corporations, but you can't deny that King Arthur Flour is a reputable source. This is the book for you if you love baking but are uncertain how to switch over to whole grains, with more than 600 pages of recipes, illustrations, photos, grain information, and resources. One of the most appealing things to me about this book lies in how familiar and favorite recipes have been retooled to include whole grains: muffins, quick breads, scones, cobblers, pizza dough, cookies, and cakes.